loving. living. small. | live small with style: small space tips - by you!! Have one of your own? Add it to the group! 45 Responses to "small space tips - by you!!" my favorite tips are to hang curtains above (and outside) of a window and to keep your small space clean- it really looks a lot bigger. thanks for the small space tip, emily!! Hm I don't really have any tips.. Maybe keep the room clean/uncluttered? I love reading your posts, not to mention just looking at them...getting lots of ideas as I live in a small apartment. The best thing I know for this little world of mine (or anyone elses) is to think laterally, outside the 9 dots, outside the box, push the envelope call it what you will. ahhh to smell as wonderful as a Candy Apple. Hi! I love your blog! During our 3 years of marriage we have moved 3 times (due to all kinds of circumstances) and now we live in the smallest place yet and I really love it. My tip is to get rid of stuff! The bigger the space - the more clutter you accumulate. We moved to our current place just recently from an apartment twice the size of this one and we're still unpacking. We have thrown out/sold/given away so much stuff already because we just don't have room for it and it's so liberating! Some of that stuff is just useless and exists only because we have been too lazy to make the decision to get rid of it. Take photos of stuff that have some sentimental value - that way you still have the memory but you don't have that elephant in the room anymore. Oh, and furniture with legs! The video was so cute. I just had to comment. For some reason when the apples were on the lollipops, they made me think of the Beatles. Favorite tip? Lately, I've been obsessing with using the walls. I love making new designs on the walls with various things that I never thought of hanging on the wall before. It really adds character to a room and makes a HUGE difference. When the apples are on the lollipops, they remind me of the Beatles for some reason. My favorite tip? I've been obsessing with using the walls. Pictures (in and out of frames), plates, random things I spot that will hang on the wall. You can make all sort of designs on the wall using the traditional trinkets, and the less traditional trinkets. It makes a HUGE difference and adds so much personality to a room. My small space tip is put double rods in your closet, one high and one low. The top is for dresses and longer items and the bottom for jeans and tops and shorter items. I love small spaces as they force you to be inventive. We have two semi-circle tables that act as bedside tables in the spare room that we steal and push together when we need a dining room table. Since we tend to eat on the couch, we only need a dining room table for company. Why take up the space with something we rarely use? The space that would typically be a dining space (we have an open-concept place) is now a little reading area. We placed bookshelves back-to-back to divide the room and put a large mirror on the end/sides of the two book shelves to hide the fact there are two shelves and reflect light. When company is over, the reading room reverts back into a dining space. Works wonderful! Your blog has helped me so much! My best tip for making a small space work is to use every inch for possible storage space. Look for unusual and unexpected places, little niches, crevices, and unused spaced to store and organize even the tiniest things, allowing you to find things more easily, live freely uncluttered, and preserve that big, open feeling even in the smallest of square footage. Thanks! Love, love, LOVE your blog!! Storage is tough, and since Im a student on a budget i dont want to resort to the standard rubbermaid 3 drawer storage units. I picked up a set of ten hat boxes (at target, but most craft stores have them too.) twenty dollars for the set, and they have a cute black and white pattern on them. I stack them all in the corner. the smaller ones hold socks, undies, scarves and belts, and other accessories. the larger ones hold sweaters, flats, and flipflops, as well as extra school junk. My bedside table is an ottoman from target. On top is a lamp and my reading glasses, inside is all of my textbooks. And the ottoman is in a cute, classy print similar to the boxes. I de-clutter my space atleast twice a year. Most clothing resalers buy gently worn stuff that is current in style, and the rest of my stuff goes to goodwill. Too much clutter makes me feel disorganized! Finally, i added two inches of space under my bed with small two inch thick scraps of lumber. I added two inches two my bedskirt with fabric from a craft store (if you dont sew, talk to a dry cleaner or local seamstress, its pretty cheap to have done), then hid long thin totes under the bed. The totes hold extra bags and shoes, and out of season clothing, as well as any office or school stuff that I am saving. My queen has room for 3 totes under it, plus a few extra blanket and sheet sets. I used to love my office-in-a-closet. You can just shut the door and all is hidden away. I've since had a daughter and now it is her closet, so now my office is in my cramped dining room! Vertical space, use it! Shelving that goes up and up. This has been especially helpful in our laundry/closet room. We now have things organized and amazingly enough the room looks larger with about 4X the amount of stuff in it. 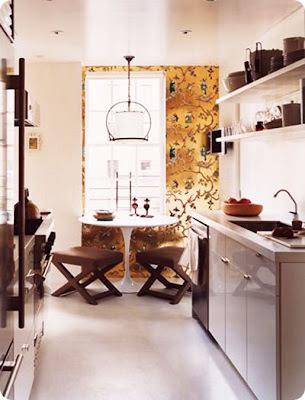 yes, love the idea of vertical space in a small space. My favorite small space idea is to create shleving between wall studs (especially in the bathroom). No extra furniture, more space! Happy Bloggaversary (is there a correct spelling for that...LOL?) My favorite tip is the reinvent furniture. How clever is that to use an old bookcase to store magazines. I have enough of 'em! ooh lots of good tips already! as a small space dweller it's hard for me to leave just 1 tip! let's see: use furniture placement to create "zones." when i had my furniture mostly up against the walls (typical placement i think) the place felt smaller...though i thought it would feel bigger. once i moved the sofa off the wall put the desk directly behind it (thus creating a 'work' area & a living area) the space immediately felt bigger. don't know the logic behind this - but it does. you guys are rocking it!! thanks for all the lovely small space tips so far!! My best small space tip is 'look up', as in add organziation, i.e. shelving, floating pieces, etc. We often overlook the space above waist height which can really be utilized in so many helpful and design friendly ways! heather - my fave tip too! in fact, my AT post tomorrow is all about going vertical in small spaces! Buy a loft bed and put your desk, couch, etc. under it. It utilizes generally unused vertical space and makes for kind of a cool look. I have so many books that it's all about built-in bookcases for me! Over the tops of doors is a great spot! Hi and a big happy birthday to you! Wow 2 years is a serious accomplishment. I love your blog, great ideas for my little place, my best tips are 1. declutter regularly 2. lots of vertical shelving, use the space you have 3. you don't need huge changes or peices of furniture to make a huge improvement! Thanks for the chance to win those lovely perfumes, they would look very cute on my bathroom shelf! My best piece of advice for small space dwellers would be to pick one vision and stick to it. Of course this will evolve over time, but if you have one vision with the items you purchase, then you can usually arrange your space in a plethora of ways. This helps to keep things looking fresh! My tip that I live with day-to-day is only keep the stuff you LOVE, and if you don't use it a lot, then you may not even NEED it in the first place. Plus, the more stuff you have, the more you'll feel cluttered, both physically and mentally. It's all about double duty. At our house the breakfast nook is also the formal dining room, library, home office, craft central and homework zone. Luckily there is room for a sideboard that houses all the clutter for the above activities. A floor to ceiling bookcase could also hold lots besides books; knicknacks, dishes, blankets, and bins/baskets for hiding the stuff you don't want to see. Thanks for the blog bday wishes, everyone! i am loving all the tips - thanks for sharing with everyone! Minimal is best! Donate things you no longer use and declutter! Everything should have an assigned space it is easier to keep tidy otherwise you shuffle clutter from one place to another. Surround yourself only with items you need/love. Take advantage of verical space. Always think up with a small space. I live in about 700 square feet and everything for storage has to go as high as possible, and take up as little floors space. and of course mirrors to bring in light and open up the space. How about storage bins that go under your bed or a leather ottoman in the living room that opens up with lots of room for storage inside! Those are my suggestions for enhancing a small space. And I LOVE the packaging for the new DKNY scents! What a great give-a-way item! Yum! I live in a pretty small space, as I moved from the midwest to the east coast about 3 years ago. My biggest tip-don't over buy. I am VERY thoughtful about everything I bring into my home. I do happen to work in fashion, so at the end of every season, I take the time to go through my closet, if I haven't worn it in the past 6 months, it goes to goodwill. Congratuations on your 2 year blog anniversary. so many great tips ... so many great ideas. My house is pretty compact so I am an expert at living small. I have a couple of tips to share. Try to purchase furniture that is multi-purpose and has closed/hidden storage, like drawers and doors. All my furniture has storage. My coffee table has a lower shelf and a bonus drawer on the backside. I can place my mags and books neatly underneath and hide away pens, paper, remotes etc inside. Same with my side table console. Instead of a television console for under the wall hung tv I have an upholstered bench that has an open shelf below. I have pretty cushions on sitting on top. It provides extra seating and a nice nook for my stereo( I have a little bose wave, perfect for small spaces) and a cosy throw are tucked neatly underneath. In my bedroom, which is the tiniest room of the house at only 9' X 8'. An upholstered headboard that lifts up to store out of season clothing was one of my best buys. Last tip, I like to keep all of my furniture low, it allows the top half of the room to remain open and thus looks and feels bigger. Congrats on your 2 yr blogoversary!! I just found your blog & it looks wonderful!! We are a family of 6 in a small space so it's easy to get overwhelmed!! My best tip is for families with kids... Rotate toys & books! Every couple months go through the kids stuff to purge & pack away some of the best loved toys while taking out the last bag of best loved toys/books! This way you are constantly organizing, donating toys that have lost their appeal & reusing what they really love! all of your tips are great! i love the idea of rotating books - a free way to redecorate your home. I actually posted about that on AT with the idea of rotating artwork every few months. one of the most important tips for small spaces is to declutter and to create hidden storage throughout. That way you can hide or cover most of your things giving the illusion of space. just found your blog through "beachbungalow8" and I'm real excited to read more...because like some of your other readers, I'm in the process of downsizing and making our "Love Shack" simply amazing. purrrrrrrge. i live with my boyfriend in 350 sq. ft. and every few months, more stuff goes out the door! its liberating and means you don't have to feel so bad when you find some silly little thing at the flea market and want to bring it home. also, boxes. lots and lots of nice looking boxes to hide the junk we need! Use vertical space efficiently--we have small rooms with high ceilings, so we have ledge style shelves running around the living room/bedroom to keep books we rarely need and knickknacks.